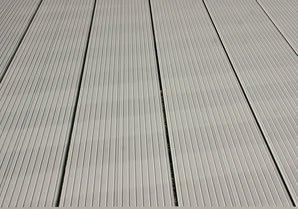 Aluminum decking is a premium decking material that lasts indefinitely. The best products are coated to make the deck slip resistant and quiet. 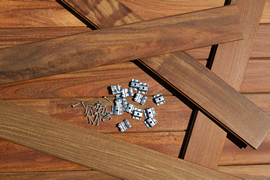 There’s no metallic “ping” with high-quality coated aluminum decking. Most aluminum planks feature a built-in water control system. The decks are installed with a non-noticeable slope away from the house, so most of the water runs off the deck and into a gutter. What seeps through the seams falls into a continual channel that carries it away from the house. This design makes the deck waterproof, meaning the area below the deck doesn’t get wet. It can be used for dry storage or, if the deck is elevated, sheltered outdoor space. 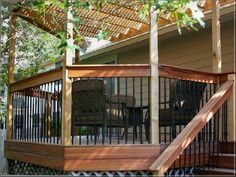 This aluminum deck buying guide gives you comprehensive information to help you decide if this is the right deck material for your home. Use it to compare aluminum decks with PVC, composite, cedar, pressure treated wood and other materials covered in our deck buying guides. We’ve included aluminum decking costs, pros & cons, features and more. Aluminum is a lightweight metal with impressive strength. Most aluminum decks can handle 225-260 pounds per square foot with joists spaced 16”. The aluminum is extruded and then powder coated with an extremely durable, fade-resistant material such as polyurea elastomer. Manufacturers like Versadeck offer texturing options such as coarse to create more grip. One or two coats can be applied. Most aluminum decking comes in planks 6” wide. Standard lengths are 12” to 20” in 2” increments, and special orders of planks to 40” can be made from some producers. The price is the main consideration. Your upfront cost for aluminum is high, but since the deck rarely needs to be washed and never requires staining or sealing, your future costs are nearly zero for the life of the deck. From a price perspective, if you plan to live in your home 10 years or more, aluminum can be cost-competitive with composite and hardwood decking because those materials require ongoing maintenance. It takes 15 years or more to recoup the cost when compared with pressure treated lumber decks and cedar decks. 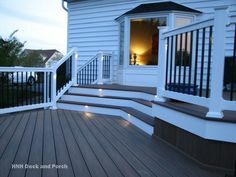 There are a few of aluminum decking cons to keep in mind as you compare deck materials. How Much Does it Cost to Build a Deck Using Aluminum? Aluminum deck repair is time-consuming, so prices are higher for repair than for building a new deck. Aluminum decking requires less maintenance than any other material. Here’s a short aluminum deck Q&A that covers additional important topics. Is an aluminum deck worth the extra cost? It all depends on your preferences. Cost aside, if you want the ultra-low maintenance of an aluminum deck and like the looks, then yes, it’s worth it. 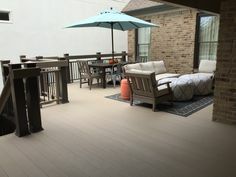 The waterproof design is a feature that allows you to use space under the deck without being dripped on, or to store items where they’ll remain dry. From a cost perspective, keep in mind the longer payback period relative to other materials, as noted above. Where is aluminum decking sold? Much of it is sold by manufacturers directly to the public. You might find some aluminum decking in home improvement stores, but it isn’t typically the best-quality products. How do you get aluminum deck estimates? Typically, the manufacturer’s web page will include design software. You provide input about the size and shape of the deck you want to build, and the software creates a design and materials list for the project. This feature can be used by homeowners for DIY installation and by pro deck builders creating decks for clients. You can call most companies for assistance with design. 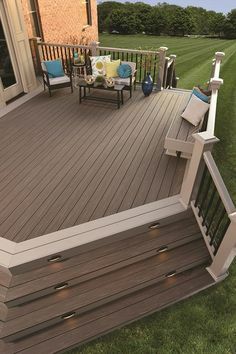 How much does the decking need to slope? Minimum requirement for most materials is 1/8” per foot which isn’t enough to notice but will allow water to run away from your home. Can the material be ripped lengthwise? Most can be, and the cut edge can be covered with trim. A deck that isn’t installed properly might look bad, make excessive noise or soon require repair. Having your aluminum deck installed by a qualified deck builder with good experience is essential to your ongoing enjoyment of the deck. When you’re ready to get estimates, we can eliminate the hassle with one convenient form. You provide a few basics about the project, and you’ll receive written estimates from screened deck builders where you live that know they must provide competitive prices to be considered. 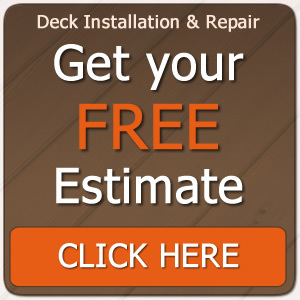 There is no cost for using the service, and you’re not obligated to accept any of the deck estimates. It is a fast way to find an experienced aluminum deck builder for the lowest cost in your area. Vinyl deck with i-lighting accent lights and wolf PVC decking in amberwood. 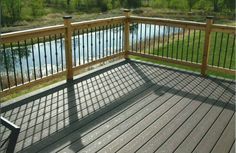 AZEK.com has all types of tools to help design your PVC dream #deck and more.